BEBE Gorgeous Pewter Color Leather Strappy Platform Sandal Heel. With 5 3/4" Heel, And 1 3/4" Midsole Platform. Bebe Berdine Silver Clear Ankle Strap Stiletto Heels Sandals Prom Dress Shoes 10. Shipped with USPS Priority Mail. Color: Hot pink. Materials: Leather lining/sole, textile upper. Tara Subkoff for Bebe suede peep toe platform. Suede upper adorned with sparkling Swarovski crystals, and genuine leather soles. 100% AUTHENTIC. Snakeskin texture is present. Slim heels. Pointy or pointed toes. Bebe Pink Magenta Leather White Elastic Slingback Sandals Heels Size 10 B EUC. Excellent condition. No toe tip wear is noted. Mild sole/bottom wear present. Bebe Gold Leather Strappy Stiletto Heels 7 Ankle Wrap. Condition is Pre-owned. Shipped with USPS Priority Mail. Bebe black leather sandals with Bebe logo rhinestones platform heels. 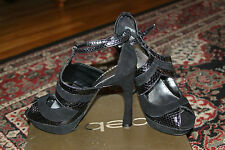 BEBE HEELS Size 5. These cute heels are in great condition, like new! Hi and welcome to my listing. You are looking at a super hot BEBE ankle high heels. Item is brand new and never worn. Comes from a smoke free and pet free home. I will ship this 1 day or sooner after payment has been received. If you prefer a different shipping carrier, please let me know. Any other questions, please feel free to ask. Happy Ebaying! I would never intentionally misrepresent an item but since I am only human, things can get overlooked. We cannot solve what we are not aware of. Womens BEBE LEATHER High Heel Stiletto. Shipped with USPS Priority Mail. New, Bebe, Madelyn, color Champaign, size 5. only worn in my house when tried on. Bebe Womens Shoes Black Gold Rhinestone Studs Leather Open Strappy Stiletto Heels 7 New in box. Condition is New with box. Shipped with USPS Priority Mail. BEBE NICE HEELS MULES. For any reason you seem to be uncomfortable with it. IF IM NOT notified to cancel the order, I will send invoice. WHERE IS MY ORDER?. · Must be in Original Condition. NEW EUPHORIA STRAP SANDALS SHOES SIZE 9 ADD THIS SHOES TO YOUR COLLECTION!! NWT BEBE EUPHORIA SHOES STRAP SANDALS. SIZE 9.. IN 4 colors: SILVER ,Red Blk and GOLD. Beige & Gold Stiletto. SMALL NICK IN LEFT TOE (SEE LAST PHOTO). Upper: Man Made Material. Be advised using flash photography may alter the quality of certain colors. Embellished sandals, featuring exotic beading on every strap. Height: 4". BEBE Pink Suede Leather Ankle Strap Pumps. Size 7. Condition is Pre-owned. Shipped with USPS Priority Mail. Bebe Shoes. Man Made Suede. Worn Suede On Back Of Shoes. 1.5" Platform. Leather Upper. See Detailed Pictures. IN NO WAY DOES THIS EFFECT THE FUNCTIONALITY OF THE ITEM. NOR WILL IT BE SEEN WHILE WEARING. Ankle strap with silver diamond buckle. NOTE: color in pictures might differ slightly due to lighting, flash, and screen resolution. Color: Red. ARE ONLY ACCEPTED IF AN ITEM IS‚ SIGNIFICANTLY MISREPRESENTED.